Blessed Mary Angela Truszkowska, baptized as Sophia Camille, was born in Kalisz, Poland, on May 16, 1825. Members of noble families, her parents were well-educated. Her mother, a devout Catholic, had a great influence on her faith. As a child, Sophia was highly intelligent and generous. However, because of her fragile health, most of her education was completed at home under the supervision of private tutors. Her days as a young student were characterized by schoolwork and reading, as well as daily Mass, adoration of the Blessed Sacrament, and nightly prayer. Her compassion for the underprivileged grew as she gained invaluable insight into the social ills and issues of her time from her father, a juvenile court judge. Sophia seriously considered joining the cloistered Visitation Sisters. However, at the age of 23, while traveling with her ailing father, she was enlightened by the Lord during her prayer in the cathedral of Cologne. Despite her love of prayer and solitude, she was destined to go among the suffering poor and to serve Christ in them. In response to God’s calling, Sophia became a member of the Society of Saint Vincent DePaul. During the day, she worked zealously for the cause of the poor and at night she prayed, constantly seeking God’s will. With her father’s financial support and her cousin Clothilde’s assistance, Sophia began to serve the abandoned children and homeless on the streets of Warsaw. In time, she opened a school and shelter to give comfort and aid to this vulnerable population. At the suggestion of her spiritual director, Capuchin Franciscan Father Honorat Kozminski, Sophia joined the secular Franciscan Order, taking the name of Angela. On November 21, 1855, she consecrated herself totally to God and forged a new religious community steeped in the values and ideals of Saint Francis of Assisi. This new community came to be called the Congregation of the Sisters of Saint Felix of Cantalice, often called the “Sisters of Saint Felix” or “Felician Sisters” by the people of Warsaw. The mission of Mother Angela’s congregation was clear. The Felician Sisters would work to ensure that “in all and by all, God may be known, loved, and glorified.” For three successive terms, she was elected as superior general of the congregation. 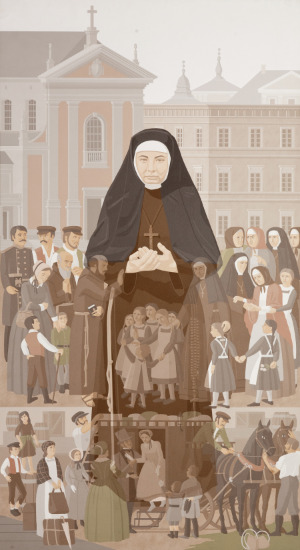 At the age of 44, she resigned from the role of superior general, but she continued to watch over and guide her spiritual daughters and heartily endorsed the plan to send sisters to North America, personally blessing the five pioneers as they left Poland in 1874. After years of suffering from gradual deafness, malignant tumors, and excruciating headaches, Mother Angela died on October 10, 1899.